Results in 3 days to 2 weeks! It's Easy - It's Inexpensive - It's Fun - It Works and It's 100% Satisfaction Guaranteed. Prove it to yourself today! This is serious stuff, for people who are serious about helping their children achieve not just reading success but life success. If you need more information we've provided lots of detail, even video, on this page and within the rest of the site. But, don't use information gathering as a way to delay. Order today, while you're thinking about it. And your child's adventure in reading success can begin right away. As an involved parent or grandparent, you already understand the benefits of early reading. So the question is... which program is right for your child? An enormous amount of scientific research has been conducted on the subject of reading instruction. Several formal surveys of this research were conducted and all of them reached the same conclusion. The results indicated the overwhelming superiority of the phonics-based approach. Phonics it is then. But which phonics program? 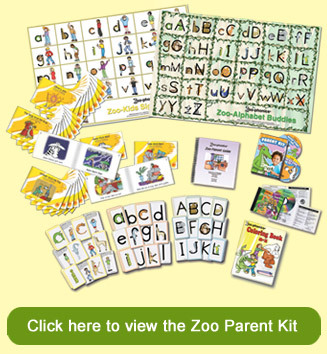 Zoo-phonics was developed during the mid-1980s by award-winning teachers, Charlene Wrighton and Gigi Bradshaw, in answer to the needs of their students. Today, the program is being used by over six thousand schools nationwide and countless homes across the U.S. and around the world and that success continues to show that Zoo-phonics delivers real results! Letters are symbols and are very abstract for young children. The more abstract learning is, the less is understood and remembered. We do not read with letter names, we read with sounds. It is easier for a young child to form a lowercase letter than a capital letter. So, knowing all this, why are most children still waiting until kindergarten then learning capital letters by their letter name while sitting still and looking at the letter? You know why. This is how it's been done in the classroom for years and breaking old habits and changing systems is pretty hard. But what if YOU could help your child, no matter what their age or abilities, learn to read, quickly, easily, while having fun and playing fun games? In Zoo-phonics we do things differently (and it works!). The Zoo-phonics Body Signals allow children to put their natural "wiggles" to good use and act as a cue for memory. Children are so ready for learning, however, it is difficult at best to teach them through abstract methods and materials – they do not understand abstractions. Make it concrete, however, and there is no limit to what they can learn. Parents, teachers and kids love Zoo-Phonics! Parents are amazed by it. Teachers swear by it. And Kids? They simply love it. Combining an adorable cast of animal characters with sounds, songs, body movements and games, Zoo-phonics is designed to put kids on a fast-track to literacy. Try it and see how quickly kids make the connection between reading, spelling, literature and writing. Zoo-phonics makes abstract letters concrete and interesting by giving them a personality of an animal that is shaped that way. The Zoo-phonics alphabet stars Allie Alligator, Bubba Bear, Catina Cat, Deedee Deer, Ellie Elephant, Francy Fish, Gordo Gorilla, etc. The sound of each letter comes through the initial sound of the animal name.